Gameplay: The main menu has options, new game, load and quit selections. Options menu has music, text on and sound on selections. During gameplay, the main menu is accessed by the ESC key. There are 9 slots for saved games. The saved games can be overwritten. Actions: The bar at the bottom of the screen has the interaction selection text buttons at left and inventory at right. Select an interaction button and then left click on the item on the screen you want it to apply to. Left click is to do the action and right click is the default action "look at". Use the right click to get information about the item. Press the space bar to see all the active spots in the screen. Inventory: The inventory at bottom right is opened when the cursor hovers over the inventory bag icon at bottom right or when you click on the inventory picture. Items can be combined in inventory by selecting an item and clicking it over another item. Tempomorphing: Tempomorphing is when Edna and Harvey go to the past. During this process, there is a character picture at bottom right of screen. Clicking on the picture changes the active character playing on the screen. Dialogues: Clues are obtained by talking to other characters completely. The dialogue will end when the last dialogue is selected. Use the period key or right click to skip over a dialogue line. See a ship sailing through the sea of a nightmare. Edna roars. Doctor Marcel enters and checks on Edna. Get out of the tower. Harvey: Open inventory and talk to Harvey. Learn that they are in an asylum and the rabbit is Harvey. Edna has lost her memory and that Harvey will help restore her memory and escape from the asylum. Look around the room. Right click to look at the padded wall, the table and the locked door. Guard: Talk to grate to have a conversation with the guard again. It is hot in here because the AC is turned off. Learn about the ventilation shaft and AC behind the padding. Talk about skillfully guarding the door. Learn about mini golf and praise the guard. Ask where he got the Babbitt and Son golf club. Learn that his father is Geoffrey Francis von Babbitt Senior. Chair: Right click the chair and the leg of the chair. Pick up leg of chair. Use leg of chair on the grate or on the table. Edna breaks the chair leg to get broken chair leg. Padded walls: Use the broken chair leg on several pads on the wall. Edna rips the pads. Take note of the one at third from top left side of the back wall. See that the label of this torn pad is different - torn up pad. Air condition: Right click the grate again. Ask the guard to turn on the AC. Talk about mini golf. Be nice to the guard. Then about mini golf and being dizzy. The guard turns on the AC. See padding fall from the torn up pad. It is now labeled airy gap. Use the broken chair leg on the airy pad. Grate: See a grate. Walk to fan. See a ventilator. Right click or pick up a screw. Harvey says that Edna can pick up a screw before without a tool. Use Harvey on a screw. Harvey says that he has to be shown things that reminds Edna of the past and he can tempomorph them to the past. Use Harvey on a screw again to tempomorph to the past. It is now 10 years in the past and in a locked basement. Edna was punished by her father for a trick played on Alfred Marcel, the son of the doctor in charge of the asylum. Read the hint about actions while in tempomorph. Harvey can collect item by drag drop to Edna or to a square at bottom of screen. As Harvey: Click on Harvey icon at bottom right. Look around by right clicking things in the basement. Walk upstairs to locked door. Check - right click the handle and the screws. Click-hold-drop the screws in inventory. Walk to out - go downstairs to Edna. Click-drag the screws on Edna to tell Edna how to get out of here. Right click the window. Take the rake and drop it on Edna. As Edna: Click on Edna icon at bottom right of screen. Pick up and then use the rake with window. As Harvey: Walk to window. Look around outside and right click everything. Walk to the back of the house. See Mattis, Edna's father and Alfred, the doctor's son eating ice cream. Walk to back door and inside the basement window. Use Article 2 on Edna. Now Edna knows how to remove the screws. As Edna: Get toenails in inventory. Walk to locked door. Use toenails with screws. Exit the basement automatically. Edna would have liked to explore her past but is automatically brought back to the cell. Open inventory and see Harvey Ability 1. Click-use Harvey1 and get a toenail. Use toenail on all 4 screws. The grate is removed and see the ventilation fan. Turn off the fan: Walk to cell. Right click the grate over the locked door. Talk to the guard again. Ask about mini golf and then his father. This time be nasty and select whack it across your skull. The guard turns off the fan. Fan: Walk to fan. Use fan and Edna asks Harvey to help push the fan. Go left and hear Dr. Marcel talking to Hulgor. Learn that the Doctor is afraid that Edna still remembers something that Marcel is hiding and that Edna's father is a convicted murderer. Office: Look at grate and see that Marcel and Hulgor are gone. Use toenail with grate. Walk to office. Look at everything. Read the newspaper clipping above the fireplace and learn that Mattis Konrad confessed killing a boy. Edna was placed in the asylum. Check the 3 photos on the fireplace mantle and see 3 photos of a boy. One photo shows Edna. Pick up the encyclopedia left of the photos on the mantle. Look at the diploma on the wall and signature comment is made. Pick up the polo mallet left of the diploma and the ballpoint pen from the desk. Walk to door. Edna goes out and back in immediately followed by Hulgor. Talk to Hulgor. He wants Edna back in her cell. Use the polo mallet on Hulgor. Watch. Open the cabinet. Pick up Hulgor and automatically place him inside the cabinet. Right click to close the cabinet. Utility room: Walk to door across the hallway. Right click the light switch left of the door and look around. Walk to the window and right click to open it. Go through the window. Antenna: Go left to roof edge. See an antenna. Look at and then use the antennae. Edna turns it. See a guard watching a TV show loose his reception. He now watches the monitors. Roof: Walk ahead at left and around the roof edge. Look down and see the area around the asylum. Right click - look at the distance and see the forest, church and town. Grate: Check the grate right of the windows. Use Harvey 1 in inventory to get a toenail. Use the toenail with the grate. Enter and go right to the chute. See that this is the other end of the chute where Edna was. Now the path is opened to the roof. Enter Dr. Marcel's office and then exit through door. Go down the hallway and see the mini golfer standing guard by Edna's cell. Chase: Walk around the corner. Babbitt chases Edna. Walk to utility door at right and enter. Try to go out the window. If slow, the Babbitt enters the room. Watch the confrontation. Immediately when able, walk to exit through the opened window. If not fast enough, you are brought back to your cell. If so, go through the chute again and out to Marcel's office. Go around the corner to be chased by the guard again. Once on the roof edge, learn that Babbitt is afraid of heights. Go back around to the grate. Enter through the opened grate and right to the chute. Enter Dr. Marcel's office and exit through door. Plant: Pick up the plant on the column left of the utility door. The plant drops to the floor and is broken. Use the column and automatically Edna pushes it under the handle of the utility door. Use the encyclopedia from the office with the column to prop the handle. Now Babbitt is trapped. Walk to hallway and around the corner and check Edna's cell at end of the hallway. It is locked. Third level: Walk to stairs at next. Look around. Surveillance room: Look at the viewing window and see the guard. If you want you can go in and see-talk to the guard. WC: Walk the hallway around the corner. Enter the WC. Check the mirror, soap, sink and towel dispenser. Exit. Break room: Enter the door at right. Look around. There's a bubble gum dispenser here. In the cabinet is a Chocolate Chunks Cornflakes box. It is made up of industrial foam and sugar. It also has a surprise in the box. Second level: Go back to the stairs and walk down the stairs. See a locked grill door with rooms beyond. There's a locked door left of the grill door. Shock therapy room: Enter the room at right with the electricity sign on the door. Look around and see where electric shocks are given to patients. Edna says she needs someone who knows his way around these things. Exit and go down the stairs. See Bruce Broker with a phone receiver and a door in the hallway. They are behind locked grill door. Main level: Go through the double doors at left. Uh oh! Talk to the guard behind the glass partition. Another security guard is called to take Edna back inside. It is his first time to handle an escaped patient, he brings Edna to the area of other patients. Find the patients that have a ticket for the laundry lift. Be at the recreation room. Walk to the double doors at left. Enter the door with the sign - Staff only - at left. Look around. Try to enter the laundry lift. Talk to the Ticket Inspector completely. Learn about the laundry lift as a system that goes around the building. The lift stops here (first level), basement and the second floor. Learn that #2 ticket holder is the next one that can use the laundry lift. The ticket holders are Mr. Frock who has a season ticket; Professor Nock who visits his Peruvian amber mine and Aluman has the third ticket. Talk to the ticket inspector again. Learn about the nervous guy. Exit and go through the double doors again. Look around the rec room. Droggeljug: Talk to the man guarding the padded tent. He would not let Edna enter the tent. Edna says to make him earn his respect. Aluman: Talk to the man by the window completely. Aluman sees the aura and chi of Edna. He wears aluminum. Learn about King Adrian who was hit by lightning and became psychic. He wins all games and has a gold prize. Learn the reason for the coat hanger. Telephone: Go right of Aluman to the telephone area. Check the phone and see that it does not have a receiver. The cable is cut. Go through the double doors at right. Bruce Broker: Try to talk to the man holding the phone receiver. He is obsessed with his stocks. Professor Nock: Enter the door at right. Talk to Professor Nock. Learn that he is interested in dinosaurs. He would not allow the channels to be changed until he learns that the dinosaurs are extinct. Use the TV and the channel is moved to the stock channel. The show is about buying and selling stocks. Talk to Professor Nock again. Learn about his use of the laundry lift. He would not lend his laundry lift ticket because he needs to get to his mine. His research is about dinosaur breeding. He says that dinosaurs hatch from occlusions in amber. Get the receiver: After watching the stock channel on TV, go back out and talk to Bruce Broker again. Select Buy or Sell dialogue repeatedly. When the choice of "Look Brucey! It's a boy" dialogue appears - select it. The phone call results in his loss of everything in the stock market. He gives the receiver. Get a dinosaur occlusion in amber. Phone area: Exit the area and be back at the rec room. Go to the phone at right of Aluman. Use the phone receiver on the fork or pay phone or cable. Look at and then pick up the coin from the coin chute. Occupational therapy room: Walk to rec room and then through the double doors at left. Enter the door at right. Look around. Beeman: Talk to Beeman completely. Learn his reason for wearing the bee costume. Learn also about his earwax output triggered by hot beverage (like coffee) allergy. Bar: Go through the door at back wall. Look around. Try to pick up the spoon-shovel in a barrel. Talk to the barkeep. He would not give a drink until the other customer is taken care of. Peter: Talk to Peter. He is depressed and it is his birthday today. Get coffee: Go through the door at back. Be in a coffee room. Look around. Pick up the cup from the floor. Use the cup on the chute of the coffee machine. Use the coin taken from the phone with the coin slot. Take the coffee. Walk to the door and be in the bar. Exit at right. Occupational therapy room: Give the coffee to Beeman. He gives back the cup filled with earwax. Take the pinking shears from the table. Toilet: Exit through door at right. Enter the door at front left and be in a toilet. Right click the light switch right of door. Talk to Petra who prepared a surprise party for Peter. Learn about the dangerous key master at the second floor. Take the bean dip from the table. Bar: Enter the door at right to the occupational therapy room. Then go through the door to be at the bar. Use the bean dip on Peter. He will rush out to go to the toilet. Pick up the cocktail menu at right side of the bar. Right click the menu in inventory and learn that there is only one selection in the menu - Stinkydrink. Talk to the barkeep and order stinkydrink. Get stinkydrink and a straw. In inventory, combine the stinkydrink and the straw to get Edna to drink it. Check inventory and see a fly that was in the drink. In inventory, combine the fly with earwax to get fly in earwax that resembles being covered by tree resin. Toilet: Exit the bar and the occupational therapy room. Enter the toilet at left. See Peter and Petra. Pick up chips in front of the lovebirds. Professor Nock: Go to TV room via rec room and through double door at right. Enter door at right. Use the fly in earwax with Professor Nock - dino DNA. He gives his laundry lift ticket to Edna. The ticket is a coat hanger. Check inventory and see that the coat hanger is labeled 3. Aluman: Exit the TV room and through the double doors. Remember that the next in line to ride the laundry lift is #2. Use coat hanger 3 with Aluman. Edna exchanges the coat hanger 3 with Aluman's coat hanger 2. Ticket Inspector: Go through the double doors at left. Enter the laundry room entrance (Staff only) door at left. Use coat hanger 2 on ticket inspector. You may pass. From now on, just click on the laundry lift to enter-use it. Mr. Frock: Walk to laundry lift. Talk to Mr. Frock who lives here in the lift. he has not seen the sun in a while that is why he's pale. There are 3 exits of the lift; one is at the laundry in the basement. Second floor laundry lift exit: Be at the second floor laundry lift exit. Look around. Electricity meter: Look at the electricity meter. With the lights off, see that the power usage is in the acceptable range. Edna automatically turns on the light, looks at the electricity meter and says someone leaves the light on all the time. Turn off the light switch. See that Edna is in the hallway with rooms behind the locked grill gate. The laundry lift exit is the far right door. Toilet: Enter the front right door. Turn on the light switch left of the door. See that there is a hose on the left wall. Exit the room. Solitary padded cell: Enter the front left door and see a viewing window into the solitary cell. Look around. Play with the alarm button. Turn on the light switch. Key master: Look at the viewing window and talk to the Key Master. He knows about a lot of things about Edna. - Get to the other side of the bars. There is a way out via the laundry lift system at the third exit at the basement. You need a soft padding to drop down to the basement exit or you will break your bones. - Get a copy of the master key of the building which also opens his cell door. Find the original master key. Bladder the guard at the control room on the third floor has one. Maybe he can be distracted. Make a clay mold of the master key. This asylum is built on a clay packed layer of earth. Use gold for the copy of the master key. Get Adrian's medal from the jigsaw contest. That might be difficult because of his mind reading act. Continue to talk to the Key master again. He is dangerous (as Petra mentioned also). Learn about the death of Alfred, Dr. Marcel's son and an altar. Get to the other side of the bars. Hoti and Moti: Exit the solitary cell room. Walk to end of hallway. Talk to Hoti and Moti, the Siamese twins lying in bed. They are wearing only one sweater and are in in the only bed that has a blanket. We need that blanket and we need the twins off the bed. Use the pinking shears on Hoti and Moti. They are not Siamese twins anymore. Exit the room and enter any of the other rooms. Come back to this room afterwards. See that Hoti and Moti are gone. Try to take the blanket but it is too bulky for Edna to carry. Use the chips taken from the surprise party toilet with the blanket. Now it's dirty and will need to be washed. Get to the other side of the bars via the third exit at the basement. Go back to the far room at right side of the hallway and be at the second floor stop of the laundry lift system. Walk to laundry lift. See Mr. Frock again. - talk to Mr. Frock and click on the dialogue: Isn't the next stop due soon. - wait and Edna will say the next exit is approaching. At the laundry room in the basement, walk to down - click on the blanket on the floor close to the stairs. Edna will jump off the laundry lift. Climb the ladder and go through the double doors. Now you are under the free area of the building. Get a copy of the master key of the building. Furnace: Go down the stairs and enter the furnace room left of Dr. Marcel's caricature on the wall. See the furnace with blazing fire. Cellar: Walk down the ladder at right. See a hole in the ground surrounded by broken spoons. Talk to the hole. Meet Almilio - Almighty Ruler - Almo who is digging a tunnel. He reached a layer of hard clay and needs spoon. The master key is held by Bladder, a guard. Climb up and then exit the furnace room. Climb up and then exit the furnace room. Walk the stairs up and then the stairs at far right. Kitchen: Enter the room at left across the other padlocked exit out of the building. Look around the kitchen. Walk to the menu board at left and see that today is free choice day. Look at the cutlery cupboard at top left. Pick up the cutlery cupboard to get knife and a fork. Look at the pot at left and the potholder on the wall to take them. Dining room: Walk to the door at left and be at dining room. Look at the ketchup and the mustard on the table to take them. Dr. Marcel's office: Exit through double doors at right. Climb the stairs to the topmost floor. Go left to hallway and enter the office at left. Look at diploma on wall and see Marcel's signature. Check the locked drawer under the diploma on the wall. Use the knife on the locked drawer. Pick up the drawer to get the old key inside the drawer. Locked door at second floor: Exit the office and go down to the area with the locked grilled door 2 floors down. Use the old key on the locked door left of the grill door. Look around the room. Looked at the portrait of Alfred. Edna is saddened. Talk to the portrait of Alfred. Check the urn and then talk to the urn. Check the pictures left of the portrait, Poozie the bear and other toys. Forge signatures: Look at the homework ledger on top shelf of the glass case. See that Mattis Konrad's name written by Edna. Harvey remembers the day that he taught Edna to forge signature. Use Harvey from inventory on the homework ledger. Tempomorph to the past. Be in Mr. Hornbush math class. Get Edna in the cabinet: Harvey has to do this by himself. Look around. Take the note from Edna's bag and use the note on Edna. Take the note again and place it on the bottom frame. Walk to hole in the cabinet at left. See a letter in Hornbush's coat pocket. Look outside the window. Place all active spots on the bottom frames: playground, merry go round, circus, ice cream stand, Ferris wheel, sun and pond. Use any of those items with Edna. Alfred snitches on Edna. Hornbush says after the third distraction, Edna will be placed in the cabinet. Use 2 more items on Edna until she is placed inside the cabinet. Letter: Walk to hole and use the letter from Hornbush's coat on Edna. It's too dark here. Take the hole on the cabinet and use it on Edna. Harvey reads that Dr. Marcel is paying Hornbush to hold back Edna in class and not to let her out when the weather is good. Learn to forge signature: Take Hornbush and place his picture at bottom frame. Walk to hole. Use Hornbush on Edna to get her back in class. Use note from Edna's bag on Edna. Harvey tells Edna to forge his father's signature. Now Edna can forge signature just by looking at it. Back at the altar room; see that Harvey 2 ability forging signature is now in inventory. - Go back down to the basement laundry lift stop via the hallway right of the kitchen or right of the main stairs of the building. - Exit the main double doors left of the main stairs of the building and get caught by the guards. Bar: Exit the first floor laundry entrance and enter the door across the hall. Go to the bar through the door at back wall. Try to pick up the spoon-shovel in the barrel. The barkeep stops Edna. In inventory, use Harvey 2 ability on the cocktail menu. The barkeeper's signature (pen with x x x) is now in inventory. Use the barkeeper's signature with the cocktail menu. I selected to write x x x. Order a drink from the barkeeper. Ask for x x x or whatever you forged. The bar keep does not have the ingredients for that drink and goes down to his cellar behind the bar to get some. Pick up the spoon-shovel from the barrel. Exit the bar and take the laundry lift to the basement laundry (2 stops away). Climb the ladder and go down to the furnace room at left. Go down to the cellar via ladder. Use the shovel on the hole to give it to Almilio. Climb up the ladder and then go down again. Pick up the small pile of dirt-clay in front of the hole. Climb out of cellar and then basement to the main floor of the building. Go down the corridor. Climb the main stairs until the surveillance room (third level) where Bladder is sitting. Enter the surveillance room. Check the trash can and the water cooler. Talk to Bladder. Learn that he drunk all the water from the cooler and is called Bladder for his capacity. Try to get Bladder to go by selecting dialogues. It doesn't work. Look at the monitors and learn that staring at the monitors long enough can be hypnotic. After a while you will start seeing letters. Monitors: See that the lit monitors can form 2 letters. Try to see which monitors should be lit or unlit to form W C.
The bar light should be on (small monitor at second from left column). The laundry lift room at second floor (top monitor second from left column) should be off. The TV room light (monitor middle at last column) should be off. All the rest of the monitors should be on. Check those rooms that need to have light switch adjusted. When correctly done, watch Bladder see the letters WC on the monitor and runs out. He could not hold it anymore. Imprint: Exit the monitor room. Go around the corner and enter the WC. See the master key under a stall. Try to take it and learn that it is attached to Bladder's belt. Use the sink to get water pouring. Use the clay from inventory with sink. Use clay mass with master key to get imprint. Get gold for the copy of the master key. Break room: Exit the WC. Enter the break room at right. Use the cabinet above the sink to open it. Pick up the chocolate chunk cornflakes box. The ingredients are industrial foam and sugar; there's a surprise in the box. Use the cornflakes in inventory to open it. For fun - try using knife, scissors or broken chair leg to open the box. Get a police badge as a surprise. Mold: Go down to the furnace room at the basement. Open the grate using the potholder from the kitchen. Use imprint in the heating furnace. Use potholder on mold to take it out of the fire. Get back to rec room: Go to basement laundry and ride the laundry lift to where the ticket master is located or go through the double doors at main floor. Use the police badge on Droggeljug. Edna is now an FBI sergeant. King Adrian: Enter the residence. Talk to King Adrian. Play with him twice and lose twice. Learn from King Adrian how he got his abilities (why must I always lose). He was struck by lightning (as mentioned by Aluman in previous talk). Aluman: Talk to Aluman about beating King Adrian. He has a plan to give electroshock therapy to Edna so that she also gets psychic ability. But before that, he needs a better coat hanger to be able to use the laundry lift system. Since the better coat hanger is #1. Ride the lift system. See that Mr. Frock uses coat hanger #1. Use the ketchup taken from the kitchen with Mr. Frock. Now he's not clean. Ride the laundry lift system until the basement laundry. Go down. See Mr. Frock inside the washing machine. Pick up coat hanger #1 on the clothes bar. Go back to rec room and use coat hanger #1 with Aluman. He says to meet him at the shock therapy room. Go to the basement exit of the laundry lift system and walk up. Go to main level and climb the stairs to the second level (two flights of stairs) to the area with the locked grill door and door to altar room. Enter the room at right with electricity sign on the door. Automatically be on the chair, Edna and Harvey are shocked! Go to rec room and talk to Adrian in his tent. Play coin toss several times with him and win but he wins back when it is his turn. Patient records: Ride the laundry lift to the basement exit. Enter the door across the furnace room. Take the form on top of the file cabinet by the door. Look at form in inventory and see that it is therapy registration form but is unsigned by the psychologist. Use the file drawer. Pick up the drawer to get Edna see that it is patient records. See a list of the patients. Select a patient and learn what is in their record. Do this for all the patients. Beeman: Pet is black pony and comes first in physical education lesson. Adrian: Pet is red cat and comes second in physical education lesson. Drogglejug: Pet is green dog and comes third in physical education lesson. Peter: Pet is blue goldfish and comes next to last in physical education lesson. Hoti: Pet is yellow rat and comes last in physical education lesson. Get the form signed: Exit the basement and go upstairs to main level. Climb the stairs until the very top floor and around the corner. Enter Dr. Marcel's office at left. Look at the diploma on the wall and see his signature. Use Harvey 2 counterfeit signature on diploma. Edna says she can now forge Marcel's signature. LOL! Use the Marcel's signature pen with the form to get signed form. Therapy: Go down to main level. Enter the double doors left of the message board at back left of the stairs and be at the kitchen. Enter through the double doors at left. Read the doorplate below the room A22 and see that it is the group therapy for game designers. Enter and be allowed to participate in the group therapy of video designers after Edna shows the signed form. You are Adrian, king of the recreation room. I was always picked second during gym class. Color of pet if it is a dog is green. Listen to the analysis. Just let go. Edna (or Adrian) is cured. Cure King Adrian: Go back to Adrian at the rec room. Ask Adrian - Which place were you picked for a team during physical education class? Edna asks about his dog. Adrian asks you what color it should be. Answer the color of his pet - red. Adrian now feels understood and knows his problem. He knows to relax now. Adrian is cured. Try to play once more. Adrian loses. Edna is the King and gets the gold medal. Make gold key: Ride the laundry lift. Go to the furnace room at the basement. In inventory combine the pot from the kitchen and the medal to get medal in pot. Use medal in pot with heating furnace. Use potholder with pot to get steaming pot. Use steaming pot with mold in inventory to get steaming mold. Get gold key: Go to any sink (kitchen or toilets). Use the sink to run water. Use the steaming mold with the sink with running water to get cooled mold. Use cooled mold to get gold master key. Outside: Go to the locked door in the corridor across the kitchen coming from the basement. Use the master key with the padlock. Exit and look around. Dr. Marcel: See Dr. Marcel comes back in in his chauffeured sedan. He asks why patient's lunch are not being served. Babbitt reports that Edna escaped. Pick up the trashcan lid and see the trash full of master keys. Van: Go to the garage. Look at the window of the van. It is partly opened and the car door is locked. Use a coat hanger on window. Use car door and Edna says to get help. See that the van is missing a wheel. Pick up the jumper cables and wrench from the floor. Sedan: Go to the sedan of Dr. Marcel parked at side of the building. Pick up the spare tire or use the polo mallet or the broken chair leg or knife or fork on the sedan and the alarm goes off. The driver arrives to check. Enter the building and go to the basement laundry lift. Try to use the lift and see that it is turned off. Have to find another way to get around. Key Master: While the driver is out checking the car alarm, and go to the main stairs down the corridor. If he is back, set off the sedan's alarm again. Climb up to the second floor. Use the master key on the grate lock. Enter the solitary room at left. Talk to Key Master through the window. Use the master key on the locked door. Talk to Key master. He will meet Edna at the garage. Distract the guard: Go down the stairs and see that the driver is standing guard at bottom of the stairs. Go up the stairs to the 3rd floor or where the Surveillance-monitor room is located. Go around the corner and enter the break room at right. Use the bubble gum dispenser and Edna chews a gum. She spits it out and it hits the window. Open-use the window and again use the bubble gum dispenser. This time the spat bubble gum goes out the window and hits the sedan. The car alarm goes off. Exit the room and go down to the main level. The driver is gone. Van: Go right of stairs and out through the back door. Go to the garage. Talk to the Key Master. The van needs a tire and an expert that knows electricity that can work on the ignition problem. Get tire: Go to Marcel's sedan. Use the wrench on the spare tire to get the spare tire. Go back and talk to the Key Master. Find a car jack: Go back inside through back door. Enter the kitchen. The chef is busy and ignores Edna. Use the trolley by the door at left. Edna is under the table of the other patients. Note the arrangement of the patients: Beeman, Prof. Nock, Adrian, Hoti-Moti and Peter-Petra. Talk to Hoti and Moti. Today is free choice food day. Tell Hoti that there is already an escape plan and need help with the tire of the van. They will help if we distract the guards. Beeman: See that Beeman's foot is bare. Use fork on foot and see that Beeman flips what he is eating. Walk to trolley and be back in the kitchen. Menu: Walk to menu on the board on the wall. See the choice of food given to the patients. Change the foods of the patients around to cause disruption. Take a food and click it over another food label to interchange them. Beeman - potato for something heavy when he flips his food. Prof. Nock - roast chicken for something he bends down to eat with his hands. Distraction: Use the trolley and be back under the table. Use fork on foot and see that Beeman flips the potato to hit Adrian because Prof. Nock is bent over eating chicken with his hands. Food fight!!!!! Install the tire: Edna stands outside the kitchen door. Exit and go to the garage. Talk to Hoti. Give the spare tire to Hoti. Hoti and Moti install the spare tire. We need Aluman to help as the expert in electricity. He is not in the rec room the last time we were there and he is not at lunch. Distract the driver: Go back inside and go to the main hall down the corridor. See that the driver is standing guard. Go back out. Use the polo mallet or the broken chair leg or fork or knife on the sedan and the alarm goes off. The driver arrives to check. Go back inside and climb the stairs. Find Aluman: Use the master key on the lock on the first level. Enter the TV room at right. See Aluman getting energy from the TV pattern. Talk to Aluman. Learn how to open the main gate. Aluman left to take a look at the car in the garage. Look close at TV and note the pattern of fingerprints left by Aluman on the TV screen. Distract the driver again: Go back down to the stairs and see the driver back at his post. Go back up to the break room at third floor and do the bubble gum routine again on an open window. The car alarm goes off. Go down the stairs and out to the garage. Energize Aluman: Aluman is not here. He looked at the van, cried, left and is at the garden right now. Walk to around the house. See Aluman sitting in front of a Zen garden. Talk to Aluman. The Zen garden charges Aluman with cosmic energy but it is not flowing right now because the stones are not attuned with Aluman. Go right to the garden by the wall. Pick up the rake. Go back to the Zen garden. Walk to and look close at the Zen garden. 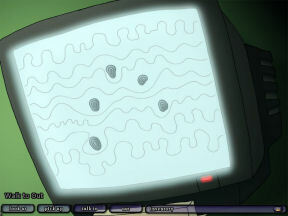 Remember the fingerprint pattern left on the TV screen. Arrange the stones to be similar to the fingerprint pattern. 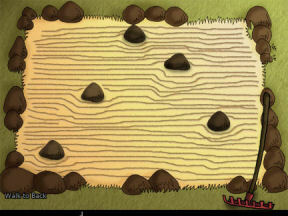 Then use the rake on the Zen Garden to make the wavy lines of the TV pattern. Talk to Aluman again. Ask about the pattern that I've raked. This is exactly what he needed. It vibrates with his chi. Charge the battery: Go back to the garage at left. Talk to Aluman. Use the jumper cable on him. Aluman charges the battery. Walk around the house again and be at Zen garden. Go to the watchtower by the gate. Enter through the door with Keep Out sign. Look around. Open the locker at the landing. Leave it open. Go upstairs and the guard hears Edna. Immediately go down and walk in the locker to hide. As soon as able, immediately climb upstairs and press the green button on the panel. Immediately use the pinking scissors to cut the cable hanging underneath the panel. Edna is caught by the guard and thrown out of the watchtower. The gate is still open. The 2 guards hear the sound of a car running. They approach the garage while Marcel's sedan goes through the open gate. Where to? Edna wants to go home to clear her father's name. Key Master turns out not to know how to drive and they crashed. The car wreck-sedan is totaled and lying partway in a pool. Hoti and Moti: Walk to sedan. Talk to Hoti and Moti. Aluman had an epiphany. Key Master is gone. There's a roadblock ahead. They decide to stay in the car wreck. Moti made a card game that one needs to guess where the ace of hearts is located. When you win you get an electric shock given by the car. Trunk of car: Use the trunk of the car. Pick up the trunk and get the towing rope. Church: Walk up to the bank. Go right down the street. See the church behind a wall and across the river. This is the one seen from the rooftop of the asylum tower. We need to go there. Roadblock: See a van and Bladder the surveillance guard is doing his thing by the railing. Go back to the street. Aluman: Walk to stairs on the cliff side and across the road from the bank-car wreck. See Aluman. Beside him is an antioxidant. Talk to Aluman. Learn about his vision and knows how to be converted to pure energy. He has to be hit by lightning. He will give the antioxidant only when he gets hit by lightning. Riverside walk: Go down the bank-car wreck. Walk right to Riverside walk. See something pouring from the bridge above to the river. Guess what. See the wall of the church at other side of the river from here. We have to get to the other side. Go back to the pool. Walk up to the bank. Walk down street towards the van. See the church behind the wall at other side of the river. Bladder the guard is still going by the bridge railing. We have to remove him to get across the river below the bridge. Van: Walk to the van. Walk to the drivers cab and see a close-up of the dashboard. Press the space bar to see all the active areas. Release-click the parking brake. Press the clutch pedal and immediately click-change gear shift to neutral. The van rolls away and Bladder runs to follow it. Bridge railing: Use the towing rope on the bridge railing. Church gate: Go back down the street and down to the bank-crash site. Go right to riverside walk. See the towing rope hanging from bridge railing. Click on rope to walk across the river. Edna swings to the other side. Go right and check the gate of the church. The lock is rusted tight. Play Moti's card game: Go back across the river and back to the crash site. Talk to Moti and play his card game. Find where the ace of hearts is on the 5 cards he is holding. Click to select the card. Win 3 in a row and you will get zapped. When asked by Moti if you are sure of your card - watch blonde Hoti's eyes and see it blink up and then down when you clicked on the correct card. If his eyes stays the same, the card is wrong. After you win, you get an electrical shock from the car. Get antioxidant from Aluman: Go across the road and up the stairs. Touch or use Aluman to give him a small buzz of electricity. Talk to him and tell him he was hit by lightning. Take the antioxidant. Church gate: Go back down and across the road to the bank-crash site. Go right to the riverside walk and across the river. Go right to the church gate. Use the antioxidant on the gate. Go through gate. Outside: Look at the graves at the cemetery by the gate. Go left and forward to the other bigger gate-church door. Look through. The road leads to Edna's home behind the gate. Enter the church using the door. Inside: Look around. Check the cross, altar and pulpit. Reverend: Walk to door at right of pulpit. Talk to the Reverend. He recognizes Edna. He was about to tell what happened to Mattis and why he has become a legend. He believes that Mattis is innocent. The organ sounded outside. The priest left to check before he finished his story. Look around the room. The priest likes music and musical instruments. Look at the book on the stand by the door. 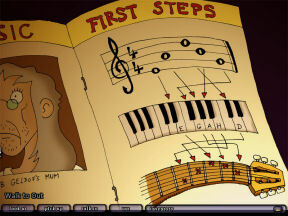 See musical notes E G A H (B) and D that is labeled on a keyboard and the strings of a guitar. Guitar and amplifier: Pick up the headphones from the floor and the amplifier-guitar by the couch. Edna automatically plugs the amplifier by the pulpit. Turn on-click the guitar amp (see red light on amp). Organ: Go to back of church. See organ pipes on the choir area. Climb the stairs. See the organ. Check the hatch on the wall left of the organ. It is the opening to clean the pipes that extends above. There's a tape recorder right of the organ. Key Master: Climb the ladder at right wall to be on the top balcony. Oh No! The Reverend was hanged by the Key Master. The Key Master blames Edna for setting him free. He locked both of them in the church. He gives Edna the puzzle of her exiting while keeping him inside. Belfry: Climb the far ladder. See the bell. Use the polo mallet on the bell. See that the Reverend swings. Key Master does not like the noise. Go down twice until the organ. Organ: See a close up of the keyboard of the organ. Flip the red switch at top left. Press any of the keys seen on the sheet in the Reverend's room - E G A H (B) or D.
The label of the keys are seen at bottom left of the screen. See that the organ is connected to the guitar by the pulpit. They play the notes at the same time and it reverberates through the church. Elevator music for the Key Master: The Key Master wants Edna to stop making noise. Check the tape recorder right of the organ. It plays elevator music. Open the hatch left of the organ. Place the headphone on the open hatch. Use the headphone and Edna automatically plugs the other end to the tape recorder. Look close at organ again. Press the first b key at left area of the keyboard. See the headphone shoot up to top balcony beside the Key Master. Play the Reverend's music: With the red switch at top left pressed down, press all of the keys seen on the sheet in the Reverend's room - E G A H (B) and D. The label of the keys are seen at bottom left of the screen. The one rabbit band plays. The Key Master screams to stop it. Bell: Go up the ladder and see that now the Key Master is wearing the headphone. Climb the far ladder to the belfry. Use the polo mallet on the bell. See the Reverend swing again. A scream is heard. Go down to the main church floor. See what happened to the Key Master. Harvey has a faint recollection of something. Edna and Harvey are in the front door of Edna's home. The door is locked. Gnomes: Look at one of the gnomes and Edna says that one of the gnomes has the key. Use the polo mallet with the order gnome that is on the pillar. Edna will smash all the other gnomes first. Automatically pick up the key from the last destroyed order gnome. Pick up clay shards of the destroyed gnome. House key: Use the house key on the door. It breaks inside the keyhole. Go around to the back of the house. Look around at the furniture. Go to shed at foreground exit. Enter the shed. Look around. Pick up the spade from left wall and the pliers from the table. Exit the shed and go to porch. Go left to front of the house. Use pliers with door to get the broken house key. Basement window: Go around to the back of the house twice to be at the back door. The door is also locked. Check the barrel with water left of door. Look at the thistles under the window. Use the spade with the thistle to dig them out and expose the basement window. Use the basement window. It is jammed. Use the polo mallet on basement window to open it. Basement: Look around at the basement. Check the items on the shelves, wood and furnace. Kitchen: Go up the stairs. Look around at the kitchen. Hallway: Check the dining room at right and look around. Look at Mattis' coats hanging on wall left of stairs. Top level: Climb the stairs. Study: Check the study at left. See that it is Mattis' bedroom and study. See Edna's picture by Mattis' bed. Pick up the lighter from the table. Exit this sad room. Bathroom: Enter the bathroom. Check the tub with water. Schoolroom: Enter the schoolroom where Mr. Hornbush gave private math lessons. Look around especially the chalkboard. Edna still is scared of the closet. Edna's bedroom: Walk up to the attic area. Look through the window and see red lights coming towards here. Check the bedroom door and see that it is locked. Go down to the bathroom. Use clay shards with the tub to get damp clay. Use broken house key with damp clay to get clay imprint. Go down to the basement. Use the furnace to open it. Use the lighter with furnace to get fire. In inventory, use clay imprint with furnace. Use potholder with furnace to get mold. Use master key with pot. Use golden key in pot with furnace. Use potholder with furnace to get steaming pot. Use steaming pot with mold to get steaming mold. Climb through basement window (or go to bathroom tub). Use steaming mold on barrel (or tub) to get cooled off mold. Use or click cooled off mold to get repaired key. Use repaired key with locked back door. Enter and go to attic-Edna's bedroom. Use repaired key with bedroom door. Enter. Edna looks around the bedroom. Harvey tempomorphs them to the past. Mattis grounded Edna for playing a trick on Alfred. Alfred stands watch outside the door. Look around the bedroom. Diary: Check the diary on the table at left. Edna realizes that today is the third of August, the day of the murder that Mattis is charged with. They have to help Mattis. As Harvey: Change to Harvey. Walk to window and be on the ledge. Look at a woodpecker tap tapping on the roof. Click-hold woodpecker and place him on the bottom frame. Look through the window and see Alfred standing watch by the door. Go back inside Edna's room. Use woodpecker with Edna. Edna says to knock on the door to trick Alfred. As Edna: Open the closet door. Use the door and Edna knocks on it. Immediately use the opened cabinet and Edna hides inside. Edna calls for Harvey to go in also. Use the closet to close the door. Alfred opens the door and looks for Edna. Edna and Harvey go out of the room and lock Alfred inside. Edna will look for Mattis at top floor while Harvey looks for him at bottom floor. They have to stop the murder. As Harvey: Harvey is scared because he thinks Mattis might really be a psychotic killer. Go to kitchen and Harvey sees a vision of Mattis being a killer of children. Harvey calls Edna. Edna leaves after scolding Harvey. Go down the basement-cellar and see another vision. Edna is called again. Go through basement window and see another Mattis vision at the backyard. Edna and Harvey checks the backyard. Edna says to call it a day. Harvey says to keep on looking. Go to back of house around the corner. See another vision of Mattis and the Prince of Darkness. Hear Mattis and Dr. Marcel discussing Edna. Mattis muses about the possibility that Alfred and Edna might marry. Matttis asks about character adjustment to be done for Edna. Dr. Marcel is doing a research on reconditioning or correction of character. Mattis sees Edna and reprimands her and tells her to go back to her room. At the attic, Edna reprimands Harvey. Harvey states that he is but a figment of Edna's imagination. Make a decision: Replay from saved game to do both decisions. Do what Dr. Marcel says.